The developing situation regarding Steve Scalise is VERY Serious! SOTN has watched with great concern the deterioration of Steve Scalise since he was admitted to the hospital in Washington, D.C.
First, it was a very serious and personal warning to the 3rd ranking member of the House leadership–Rep. Steve Scalise of Louisiana. Secondly, it was meant to be a warning to every other member of Congress not to buck the Deep State agenda. They all know exactly what that agenda is. Rep. Scalise was a fierce patriot and a true conservative. His many signature causes show him to be the real deal and arch-enemy of Deep State who was no friend of the RINOs in Congress. Not only was Scalise the highest ranking elected official from the Tea Party in the U.S. Congress, having attained the position of Majority Whip, he was also a no-nonsense kind of guy. You know how those real gutsy Italian-Americans can be when they latch onto a righteous cause. 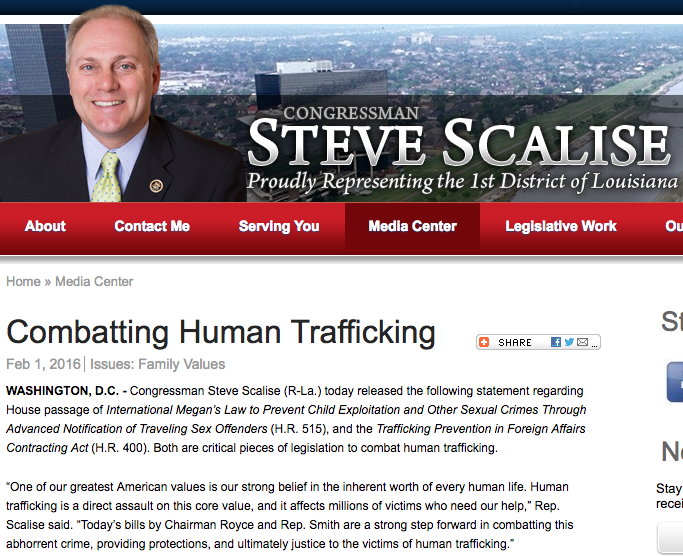 Well, that righteous cause that Steve has advocated against is human trafficking. The following video portrays just how strong his advocacy is in this regard. Which also happens to be the most radioactive issue throughout the USA in light of the Pizzagate scandal blowing wide open just before the election. VIDEO: IS THIS WHY REP. STEVE SCALISE WAS SHOT TODAY? Was the Berniac shooter really a programmed assassin from the CIA’s MK-Ultra Monarch mind control program? The mainstream media (MSM) did somersaults to project the image of an ultra-liberal, Trump-hating, leftwing nutcase for mass shooter James T. Hodgkinson. However, the MSM narrative is not stacking up with the most likely reality of the shooting spree. It appears that Hodgkinson went there to specifically shoot Scalise, the highest ranking Congressman on the ball field. And the preceding video clearly demonstrates why that is the case—Pizzagate. For those who are uninitiated in the realm of the most powerful control mechanism that Deep State has, it is known as Pedogate. There is no other means of threat or method of coercion that Deep State has at its disposal as effective as Pedogate. And everyone in Washington, D.C. knows it. Steve Scalise appears to have further opened this Pandora’s box. The human trafficking legislation that he was pushing is — by far — the most uncompromising and severe ever to have been floated in the U.S. Congress. If ever prayer was needed to preserve the life of Steve Scalise, it is right now. The following report about President Trump’s visit to his bedside indicates why. Key Point: June 14, 1946 is Donald Trump’s birthday. He has a special kinship with Rep. Steve Scalise, especially because of their shared political agenda and patriotic orientation. Just like Kathy Griffin’s beheading video was used to send an extremely threatening message to the POTUS, so was this ‘birthday present’ sent by Deep State—mafia style. Steve was shot on Wednesday, June 14th. Truly, Steve Scalise is one of those very few elected representatives at the federal level who deserves our prayers and blessings, love and support. N.B. The analysis delineated below reflects many of the same conclusions of an independent investigation which we have been conducting at SOTN. We, too, strongly believe that Steve was sent to the Washington Hospital Center to expose him to the same bad actors who killed Seth Rich. The following is going to have to stay top posted until tomorrow, because it is VERY important. Here is the confirmed information many are looking for, as it turns out I had this and did not think of it until now. 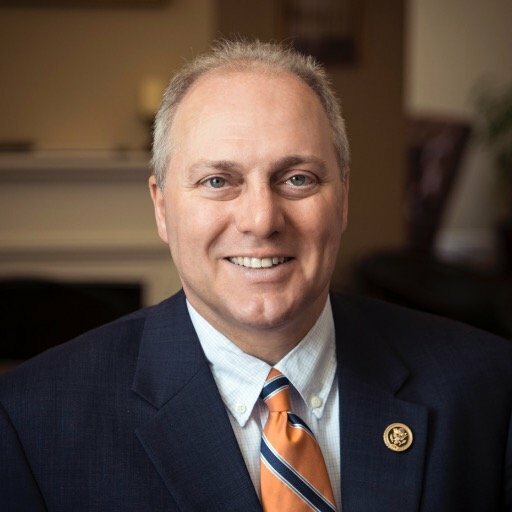 Scalise is confirmed to be at the Washington Hospital Center. Guess what? The doctor who blew the whistle on the Seth Rich murder was at the Washington Hospital Center. It is important to keep my 8 points proving Scalise is in the process of a staged murder being done at the hospital on top of this page so I am going to link proof rather than consume the top of the page by posting it directly here. Here is a report confirming near the top of it that Scalise is at the Washington Hospital Center And here is the doctor’s testimony that Seth Rich was murdered at the Same Washington Hospital Center. This clinches it, the Washington Hospital Center appears to be where people go when they are supposed to die. 1. First of all, the early reports said the guy used a handgun and a military issued M4 carbine. Now this has morphed to other guns that better match a story line that will lead to the death of Scalise. BUT MAKE NO MISTAKE: EARLY ON IT WAS A MILITARY ISSUE M4 CARBINE. A CONTROLLED ITEM. AND THEY CAN’T CHANGE THEIR STORY WITH SUCH AN OBVIOUS ITEM. PERIOD. 2. Second, RIGHT FROM MINUTE ONE the media was claiming 1 congressman down, 216 to go. And they were rejoicing. But it was impossible to say that, because early on there were multiple people shot and they would not have known how many congressmen were actually shot, let alone that 1 would die, thus leaving the number “216 to go”. The only thing that makes sense with this as far as I see it is that they knew for sure ONE would die, and the only way they’d be sure of that is if they knew someone in the hospital was there to finish the job. From there, they’ll fabricate any story line that fits. 3. Here we have a patsy, who was living a perfectly normal life, then suddenly wonked out, “lived in his van for two months” with no one knowing where he vanished to, and suddenly he surfaces and does this. That’s fishy folks, and fits with “The CIA or some other Rothchild/Soros owned entity successfully drugged this guy, tripped him out, made him malfunction while he was out with the van and then programmed him for this.” The fact he did the shooting, as the “first five minute” reports stated: with a military issued M4 carbine, would prove he was provided his weapons by someone beyond the ordinary. Who would that be? You guess. 4. The guy was an awful shot. From this perspective it could not have gone better. With the guns this guy had, hillbilly joe or even six-pack bob who might have a gun or two of that type would have accomplished 25 head shots with 25 bullets fired. All shots were within 50 yards. That’s too easy of a shot for anyone who knew anything about guns at all to miss even once, with a gun as good as even the worst assault rifle, including the SKS. How could you get such an awful shot? Answer: WITH A PROGRAMMED PATSY who knew nothing about guns, that you suddenly abducted and mind wiped for the job. That sure fits “vanished with the van for two months, ” only to suddenly surface with this. 5. Scalise showed up at the hospital in fair condition. This was reported so widely that even Politico reported that he was in good spirits and called his wife before the surgery. Suddenly, after the surgery, he skipped right over serious condition straight to critical condition and the hospital started lying, saying he was in shock and delirious and in critical condition before he went into surgery even after liberal crap outlets like Politico reported he was fine. This is the biggest key indicator that he was sent to a particular hospital to die. They need their cover story for his death, and can’t say he was cheerful when he went into surgery after they intentionally botched it. Calling the wife in a cheerful mood simply won’t do, even if the worst liberal rags reported that. 6. Very suspicious: Now, the media is trying to scramble the story line about the gun used, to try to explain the details on the ground. They are sort of leaning towards the SKS, which might have a solid bullet deflect off the hip and cause serious internal injury, at the same time it explained why he was such an awful shot. But the SKS is not that bad, inside of 100 yards it is accurate enough to not make a difference and all shots were close. And they botched it early on by saying it was an M4 carbine. So the SKS story line is a blunder. 7. Ok, so let’s say somehow our patsy got ahold of a NOT military issued .223 (which is the caliber of an M4 carbine) and he had a knock off. It will still be identical to the military version when it hits something. What happens when you hit a hip with that? Well, nothing should really happen. The bullet is designed to fragment in soft tissue and make a huge mess, but if it hits something solid like a hip, it ought to do significant damage at that point, but stop there. They therefore want the story morphed over to it being an AK or an SKS, because that round penetrates better without fragmenting and would fit the story line of Scalise showing up all cheery and then dying because the bullet deflected into vital organs. I guess a .223 might do that too, but if you get a bad hit with a .223, you will NOT feel cheery and call the wife, PERIOD. The only way he’d be cheery after getting hit with a .223 is if it was neutralized when it hit the hip bone and spread nowhere from that. So if he was reported as cheery before going into surgery, that would be what happened. And there would be ZERO chance of reducing to critical condition just because someone dug around in your hip. So we are watching the story about the gun used twist and turn to fit whatever happened when a doctor intentionally botched the surgery to reduce Scalise from fair condition to critical. SKS it will be then. Trump may have figured this out, he’s not stupid. So he sent the best white house doctor. What happened next? 8. CNN and all the other liberal media outlets FLIPPED OUT and started trashing Trump for sending that doctor, who would obviously be outside of the control loop of a calculated hospital murder. That would mean key people at CNN and other liberal outlets KNEW THERE WAS A MURDER IN PROGRESS, and were pissed that Trump found a way to interfere with it. Will Scalise make it? Only time will tell now, IF the doctor Trump sent will be good enough to see the obvious, and get Scalise back away from critical condition. If Scalise dies, he was Seth Riched pure and simple, and that is my FINAL ANSWER. This is super easy to prove. Prior to entering surgery, the Whip was in good spirits and spoke to his wife by phone.” – Politico. AND NOW HE’S ON HIS DEATH BED? HOW?????! Scalise entered the hospital in FAIR condition. Fair condition means you can be missing an arm or leg, or have some other horrible injury, but your vital signs read completely normal. Scalise had perfectly normal vital signs when he entered the hospital. Then he leap frogged right over serious condition (where vital signs are no longer normal) to critical condition (where vital signs indicate you might die.) Folks, that can’t happen in today’s world. You don’t go from fair condition to critical condition unless something causes it. Trump responded to this by sending his own white house doctor to oversee Scalise. AND WHAT HAPPENED THEN? CNN and other commie news outlets flipped out, and started shredding Trump for sending a doctor he trusts to oversee Scalise! It does not take a huge brain to figure out why! Here’s why: If Scalise went from fair to critical condition, someone who wanted him dead caused it, just like Seth Rich. And someone at CNN knows the plot, and that Scalise was sent to that hospital to die. And now, because Trump sent a doctor that is not there to kill Scalise, CNN can’t handle it and is whining and moaning about it. And if Scalise died, there will be a real doctor right there, to say it was caused by foul play. I believe Scalise was sabotaged during the surgery, which was botched on purpose to kill him. That’s the only way digging a bullet out of a hip is going to put someone who was perfectly stable and in fair condition, into critical condition. You can’t go from fair condition to critical condition like that. It just does not happen. He’s being Seth Riched NO IFS OR BUTS. Scalise was a good guy. He was one of us. Let’s hope Trump’s appointment of a trustworthy doctor saved him. Previous articleWho is really behind all the false flag terrorism?